Wild Spartans is a sophisticated pokies game from Red Tiger Gaming, based around the elite warriors of ancient Greece. Featuring a classy design, dramatic soundtrack and multiple bonus features, Wild Spartans is an exciting game to play for real money. Find out how and where to play for real money at the best online casinos. 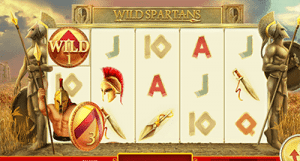 Wild Spartans is a five-reel, three row game offering a number of low paying and high paying symbols, as well as several bonus features. The reels are set against a realistic ancient backdrop, with expansive plains of wheat and grey skies, while two perfectly chiselled Spartans stand to the side of the reels armed with spears and shields. A dramatic soundtrack sets the scene for suspense and action, while the Spartans occasionally come to life to add to the excitement. Red Tiger Gaming is known for its proclivity towards the Asian market, so even though Wild Spartans uses an ancient Greek theme, there’s still a slight oriental undertone to this beautifully designed pokies game. The game uses a lot of red, which is known to be the colour of prosperity and fortune in Chinese culture, which is beneficial if you’re superstitious about luck. Wild Spartans is available for instant-play at one of the top rated pokies sites on the Internet, Slots Million. If you’re new to Slots Million, signing up via our links will get you exclusive access to a new player welcome package that includes up to $100 in bonus money when depositing cash for the first time. You can use the search function at Slots Million to locate Wild Spartans, or narrow games down to category by software provider to search for Red Tiger Gaming titles. As a browser based game, no downloads are required to play Wild Spartans. Wild Spartans is a five-reel game with 10 fixed paylines, so all you need to worry about it setting the size of your bet by clicking the plus and minus buttons in the stake section at the bottom of the reels. Minimum bets start at $0.20, with maximum bets capped at $60.00 per spin. All wins are credited automatically to your online casino account. Wild Spartans can also be sampled for free at Slots Million in practice mode, so you can get a feel for the game before moving on to play for real money. Wild Bonus – The wild symbol is the games highest paying symbol, but on top of its high value, it also provides bigger chances to win by becoming locked for a random number of spins. When the wild lands on the reels, a Spartan warrior bursts out from behind the symbol to award a certain number of spins that the wild will remain frozen for. Wilds can stay locked for up to five spins, boosting your winning potential dramatically, especially when you land more wilds and multiple wilds become locked in place. In addition, at any time the Spartan guards standing to the side of the reels may start beating their spears to increase the number of spins for which the wilds remain locked. 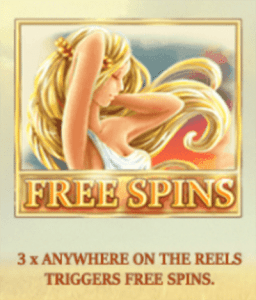 Free Spins Bonus – An appearance of three of the goddess symbols anywhere across the reels will trigger free spins. The number of free spins you’re awarded is based on how many times the Spartan warriors bang their shields. The locked wilds bonus is also available during free spins, which is where you’ll find the highest winning potential for this game. Wild Spartans follows the typical Red Tiger Gaming design, which is a little more on the sophisticated side and will suit players who don’t care for flashy animations and cheesy themes. It’s a nice looking game with some good basic bonus features. There are no unique bonus rounds, and the free spins were incredibly difficult to trigger during our testing, so it’s the locked wilds that really make this game worth playing. If Wild Spartans doesn’t quite hit the nail on the head for you in terms of bonus features, there are plenty of other online pokies that use ancient Greek and mythology themes, like Microgaming’s Legend of Olympus or NextGen’s Titan Storm.